Actor Abe Vigoda has changed my mind about when is it too late to make a life change. I beliieve it is NEVER too late to learn new things, start a new business, switch careers, or go into a different industry. 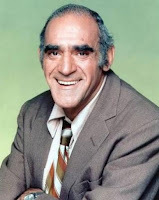 Abe Vigoda, if the name does not ring a bell, is the dour-faced actor famous for playing the character Fish on the TV sitcom "Barney Miller." A Google search will show Vigoda, who is still a working actor at age 87, got his big break was his first movie, "The Godfather," in which he played Sal Tessio. "The Godfather" was released in 1972. Working backward you will see that Vigoda didn't begin his movie career until he was over 50. More impressive is that, at age 87, Vigoda - who has a slightly cadaverous appearance that makes him look ready for the Old Folks Home - is still a competitive handball player. If Abe Vigoda could get his first movie role at over 50 - beating out actors his age who had decades more credentials and experience - then I am convinced that you and I can start a new career or business at any age.